Award Year: 2009 Despite well-known physical health disparities between blacks and whites, a puzzling research paradox shows no major differences in mental health disorders between the racial groups. James S. Jackson, Ph.D., Daniel Katz Distinguished University Professor of Psychology and Director of the Institute for Social Research at the University of Michigan, will explore the reasons behind these seemingly conflicting findings. His study, Race Difference in Physical and Mental Health Disparities: Biological Mechanisms and Behavioral Change, will consider the connection between mental and physical health and examine how the effects of stressful living conditions combined with unhealthy behaviors may create the patterns of health disparities that many policymakers and health care providers find perplexing. Using the Affordances Framework, a new and complex way of thinking about disparities, Dr. Jackson will analyze how available coping strategies, such as overeating, smoking, alcohol and drug use, may lead to non-compliance with medical advice contributing to the onset and course of chronic diseases in blacks, while buffering the downward spiral toward mental illness. 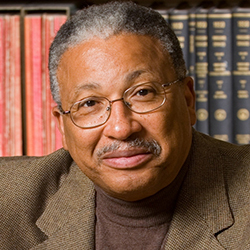 Dr. Jackson believes the framework offers a fundamentally different approach to how we might view the root causes of disparities (especially in cardiovascular disease and type 2 diabetes), if blacks and other highly-stressed population groups preserve their mental health by continuing to engage in unhealthy behaviors, rather than adhering to recommended lifestyle changes. His findings should produce information that can enhance understanding and guide the design of more effective interventions and programs for reducing health disparities. James S. Jackson is the Daniel Katz Distinguished University Professor of Psychology, professor of health behavior and health education in the School of Public Health, and director and research professor of the Institute for Social Research. He has recently been appointed a Visiting Scholar for the Russell Sage Foundation. He is the past chair of the social psychology training program and director of the Research Center for Group Dynamics, the Program for Research on Black Americans, and the Center for Afroamerican and African Studies, all at the University of Michigan. He is also past chair of the section on Social, Economic, and Political Sciences (K) of the American Association for the Advancement of Science (AAAS). He is a former chair of the section on Social and Behavioral Sciences, the Task Force on Minority Issues of the Gerontological Society of America, the Committee on International Relations, and the Association for the Advancement of Psychology of the American Psychological Association. He is a former National President of the Black Students Psychological Association and the Association of Black Psychologists. Dr. Jackson has served on the National Advisory Mental Health Council of the National Institute of Mental Health and the National Institute on Aging Advisory Council and the Board of Scientific Counselors of NIA. He was recently named to the NIH Advisory Council to the Director. He is a fellow of the Gerontological Society of America, Society of Experimental Social Psychology, American Psychological Association, Association of Psychological Sciences, International Demographic Association, and the American Association for the Advancement of Science. He is the recipient of the Distinguished Career Contributions to Research Award from the Society for the Psychological Study of Ethnic Minority Issues within the American Psychological Association, the James McKeen Cattell Fellow Award for Distinguished Career Contributions in Applied Psychology from the Association for Psychological Sciences, the Presidential Citation from the American Psychological Association, and the Medal for Distinguished Contributions in Biomedical Sciences from the New York Academy of Medicine. He is an elected member of the Institute of Medicine of the National Academies of Sciences and a fellow of the American Academy of Arts and Sciences. Dr. Jackson has conducted research and published numerous books, scientific articles, and chapters on international, comparative studies on immigration, race and ethnic relations, physical and mental health, adult development and aging, attitudes and attitude change, and Black American politics. Over the last 30 years he has been the principal investigator of over two dozen funded NIH and NSF grants, and is currently directing the most extensive social, political behavior, and mental and physical health surveys on the African American and Caribbean populations ever conducted, "The National Survey of American Life" and the "The Family Connection Survey across Generations and Nations," and the National Science Foundation and Carnegie Corporation supported "National Study of Ethnic Pluralism and Politics."